I’ve been following the latest TED saga since Day One. (See my post here, here, here, my EPIC thread on Facebook, and my posts on TED Conversations.) Readers of this blog and my Facebook friends are probably tired and nauseated by the attention I’ve given on this issue. I think it’s unfortunate that this issue didn’t catch the attention of mainstream news and popular tech blogs the way the Nick Hanauer’s TED controversy did. So far I’ve only seen a few fringe blogs and alternative news sites that jumped on this story. I actually submitted this story to Boing Boing but maybe my submission was buried in the avalanche of submissions or that the editors think that this story is not important or interesting enough to spread to the interwebs. I’m disappointed that this latest TED fiasco didn’t go viral, but I’m hardly surprised. This issue is not for mainstream consumption. This issue is political but not the typical political issue that you’ll see in the mainstream media circus. This issue boils down to “War of the Worldviews” (to borrow the term from Mlodinow and Chopra’s book collaboration). A couple of bloggers who have been following this story calls it “The Psi wars Come to TED” (see Craig Weiler) and “Materialists vs. Idealists” (see Markus Anthony). I agree. In fact, that was the precisely the essence of Sheldrake and Hancock’s talks — Scientific (materialism) Dogmas and “War on Consciousness“. Knowingly or unknowingly, TED essentially proved Sheldrake’s and Hancock’s points when TED “censored” (ok, fine, “suppressed”) their talks. As of this writing there are only about 3 days left before the “debate” threads on TED Conversations close for good. So far I haven’t seen any convincing arguments from the TED staff, TED Curator (Chris Anderson), TED Science Board, or TED Brain Trust regarding a valid or persuasive justification for pulling out Sheldrake and Hancock’s TEDx talks from their official distribution channels. 1) The people at TED were not interested in a real debate. They just wanted a place holder for people to vent their frustrations until they get tired and move on. 2) The people at TED knew that they’ve made a mistake of pulling out Sheldrake and Hancock’s videos and framing it with poorly crafted justification, let alone the slanderous accusations that TED leveled at both Sheldrake and Hancock. However, TED cannot afford to explicitly admit this mistake in public. As a corollary, TED can’t issue a public apology to Sheldrake and Hancock for fear of backlash from the “skeptical” and scientific materialist communities. 3) The people at TED know that they are on the losing side of the debate if they accept Sheldrake’s and Hancock’s challenge. 4) Therefore, it is best for TED to just stay mum on this issue and let this fiasco pass and die down. However, I just wish that if there are no takers from TED to accept Sheldrake’s debate challenge, maybe TED can arrange for a Sheldrake-Coyne debate. But of course, TED will not do it because it would only inflame the issue. The people at TED want this issue to go away and die down, as quietly as possible. TED will probably be forced to take Sheldrake’s debate challenge if this controversy goes viral. But without it going viral, TED has no reason to yield. That said, IMHO, if given the opportunity of a fair public debate setting, Sheldrake will rip Coyne’s arguments apart. I’ve seen Jerry Coyne do a lecture and I read his blog wherein he regularly engages in name-calling people who don’t share his views. Compared to Sheldrake’s tempered demeanor, scientific knowledge, philosophical sophistication, and clear and concise articulation, Coyne lacks what it takes to make a convincing case against Sheldrake in the arena of a fair public debate. Don’t just take my word for it. See for yourself. Below are videos of Sheldrake and Coyne’s lectures. Watch them and draw your own conclusions. You read that right. Looks like Mr. Coyne is on a roll. He (and PZ Myers) were instrumental on getting Sheldrake and Hancock’s TEDx talks to be pulled out by TED, which makes me wonder: Is Jerry Coyne one of the “anonymous” members of the TED Science Board? The thought of it sends shivers down my spine. Oy vey: TEDx continues the woo—now with more self help! “This is a nice victory for rationalism, and big plaudits go to TED and TEDx for making this decision. They’re gonna catch a lot of flak for this, and many accusations of “censorship”, but what they did was to stand up for science. So congratulations to Jerry Coyne for another stellar job. Once again, “real science” came out victorious, unscathed by the threats of woo and pseudoscience! Having said that, I’m not surprised by TED’s decision to axe TEDxWestHollywood. I’ve seen the speaker line-up. If TED cracked down on Rupert Sheldrake and Graham Hancock then it is to be expected that TED will do the same with the likes of Russell Targ, Marilyn Schlitz, and Larry Dossey. Speaking of Russell Targ… He is often lumped with New Age and “pseudoscience” by people who don’t know his background and history of his scientific work. Never mind the fact that Targ’s (and his colleague Hal Puthoff) research on remote-viewing was good enough to be funded by the CIA (see Project Stargate). Incidentally, Targ has just published a new book where he has divulged some declassified information from the CIA remote-viewing program. TED will never dare touch this material. So we’ll just have to rely on our own research and on other alternative news media to be informed. In the meantime, TEDxWestHollywood is moving forward with their planned event. And the TED saga continues… digging themselves deeper into the screaming abyss and mediocrity of the status quo. Alex Tsakiris of Skeptiko interviewed Rupert Sheldrake to get his perspective on the TED controversy. Here’s what Sheldrake has to say. He speaks softly but his words pack a lot of punch. The difference here is that my talk was flagged up as being pseudo-scientific because Jerry Coyne didn’t like it. Well, Jerry Coyne is a very bigoted man who writes very loud-mouthed things on his website. I don’t take him very seriously. I mean, he’s a polemicist, a kind of Dawkins-type polemicist. So they pay a lot of attention to what Jerry Coyne and PZ Meyers said on their websites. If there had been a similar attack by, for example, Christian Fundamentalists on Dawkins they would have ignored it. But if it’s by scientific fundamentalists then they pay attention, and what’s more don’t just pay attention but dig themselves into a hole trying to justify this. Oh, snap! TED, Jerry Coyne, PZ Myers, you’ve been served! And finally, the “debate” threads on Sheldrake and Hancock’s TEDx talks are now closed. But before it closed for good, one of the participants in TED Conversations made this astute observation. He summed it up very well. With little time to go, this “Conversations” thread is showing about 2000 comments, about 20% more comments than the next highest thread (the one discussing Graham Hancock’s talk with about 1655 comments), and nearly six times as many comments as the next highest thread with around 339 comments (on an unrelated discussion). The issue has definitely interested TED participants. Note that many individuals made multiple posts. The three most popular TED talks of all time, have (1) 15,480,019 veiws with 2937 comments (2) 10,741,137 views with 2425 comments (3) 10,311,697 views and 1287 comments. Two have been online for over fives years, the other for 18 months. Sheldrake’s and Hancock’s talks have been online for less than 4 months. There were also 1677 + 325 + 483 comments from previous combined discussions, making the average comment count (2000 + 1655 + 1677 + 235 + 483) / 2 = 3025 comments per talk. By this calculation, it makes both talks the post popular of all time by comment count. Popularity does not imply support or endorsement of their ideas. My personal estimate is that people oppose TED’s actions by around 10-to-1 (I think it is actually more than this, as I found it difficult to find people who support TED, but wanted to be conservative). This does not necessarily translate into support for Sheldrake’s and Hancock’s ideas, only their right to be treated reasonably. Having read through the vast proportion of posts, my personal assessment is that the issue is not as clear cut as the science board and advisors would suggest, from which I hope that the necessarily actions will be taken. As I said in my very first post on this TED controversy: When all is said and done, I’d like to thank TED, PZ Myers, and Jerry Coyne for making Sheldrake and Hancock’s TEDx talks more popular than ever. Congratulations on a job well-done, science boys! I hope you learned your lessons on The Streisand Effect. TED Curator, Chris Anderson, posted his closing statements on the Sheldrake-Hancock “debates.” Read it and weep. Thanks to all who participated in this conversation on TED’s decision to move Rupert Sheldrake’s talk from YouTube to TED.com. It was scheduled as a 2-week conversation, and has now closed. But the archive will remain visible here. We’d like to respond here to some of the questions raised in the course of the discussion. Some asked whether this was “censorship.” Now, it’s pretty clear that it isn’t censorship, since the talk itself is literally a click away on this very site, and easily findable on Google. But it raises an interesting question about curation. Should TED play *any* curatorial role in the content it allows its TEDx organizers to promote? We believe we should. And once you accept a role for curatorial limits, you have to accept there will be times when disputes arise. A number of questions were raised about TED’s science board: How it works and why the member list isn’t public. Our science board has 5 members — all working scientists or distinguished science journalists. When we encounter a scientific talk that raises questions, they advise us on their position. I and my team here at TED make the final decisions. We keep the names of the science board private. This is a common practice for science review boards in the academic world, which preserves the objectivity of the recommendations and also protects the participants from retribution or harassment. Finally, let me say that TED is 100% committed to open enquiry, including challenges to orthodox thinking. But we’re also firm believers in appropriate skepticism, or critical thinking. Those two instincts will sometimes conflict, as they did in this case. That’s why we invited this debate. The process hasn’t been perfect. But it has been undertaken in passionate pursuit of these core values. The talk, and this conversation, will remain here, and all are invited to make their own reasoned judgement. Never mind that TED have not responded to Sheldrake’s rebuttal to their justification of “censoring” (oh, sure, let’s call it *suppression* instead) Sheldrake and Hancock’s talks. Never mind that TED never apologized for their inflammatory statements against Sheldrake and Hancock. Never mind that the overwhelming majority of the people who participated in the TED Conversations did not agree with TED’s decision to pull out the talks and have asked TED to reconsider and reinstate the videos in their rightful distribution channels. There was not much of a debate coming from the TED staff or Chris Anderson. It’s just a re-statement of TED’s knee-jerk and intellectually indefensible decision. In short, Chris Anderson’s closing statement is a classic cop out. Alex Tsakiris of Skeptiko accurately described Chris Anderson’s response as “tone deaf.” Craig Weiler described it as “It’s a complete non answer. But given how it was all going down, I can’t say that I expected anything different.” And finally, Craig Weiler also summed it up on his blog with his recap. What open enquiry? What critical thinking? Where is the appropriate skepticism? Is it a secret? An endeavor can hardly be called an open enquiry or even a debate if none of the important questions are ever answered. So what are we left with? Nothing much. It has all the content of a BP press release right after the oil spill. I suppose I could go on criticizing them, but what’s the point? The fact that they’re not even trying to defend themselves pretty much says it all. Well said! This could well be a turnaround for the good. Did TED *really* think they were going to become the only sounding board for progressive ideas in science and the philosophy of science? Their intellectual arrogance is truly breathtaking! Fascinating, all of it. Thanks so much for following this and posting about it. Well written post, thank you for covering this issue. Rupert whom I’ve invited to Skype into our Ex TED event on April 14, which is Livestreaming to the world https://new.livestream.com/extedwesthollywood. I’ve asked TED to publicize this for checking on whether they were right in fearing our program would tarnish the TED brand — all help to get them to so that appreciated. It’s important enough that this outstanding program — designed to impact thinkign about our workdview — be seen to be footing the bill myself if TED doesn’t reimburse me. Comments need spell check. Am moving too fast. Arghhh. I am getting tired of this discussion. 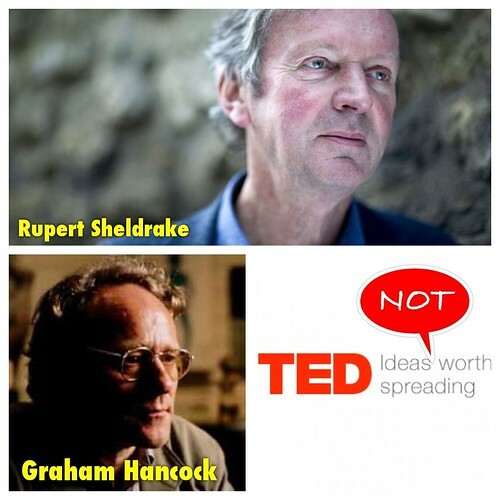 Sheldrake and Hancock are gifted speakers. And yes they point out very interesting thoughts worth investigating (by them) you can not demand the whole scientific community has to investigate their ideas. And their thoughts and beliefs are not very based in science. There are is no evidence and no research with scientific output. Which does not mean it is pseudoscience. It just means that they have interesting hypothesis. TED can refuse this and do what they want to do, If they want to be scientific dogmatic let them. We need that too. We live in a different world Hancock and Sheldrake are not censored by the internet. We can investigate them heck we can even talk and mail to them. So what do you want? Do you want TED bleed to death? Do they really deserve that? I it not nice what they did, but they are not GOD. They did a lot of good things. I am not saying they did a good job with censoring Hancock and sheldrake, i think it was poor judgement based on precedent were pseudoscience was very clear. Al I say is leave it alone, let TED be TED whatever they become. We do indeed have mainstream coverage. This was posted by c4chaos on Saturday, March 30th, 2013 at 11:39 am. Bookmark the permalink.